I'll be back in a few days with more sitar insanity, but meanwhile, you shall discover Volume 12 of the Incredible Sound Show Stories, which mark a return to better choice of songs. 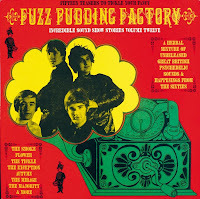 So get your grubby mitts on another classic collection of classic, rare UK Psych songs. Another great package from the ISSS collection. Thanks again and again. thanks for keeping the ISSS comps coming. I've got it in the current playlist for this weekend. I'm sure it's gonna be another winner. Greetings from a Brazilian fan of 60s psychedelic music.